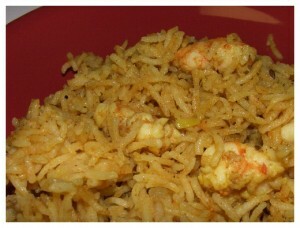 Prawn Pulao recipe by Nazia Nazar at PakiRecipes.com. Wash the prawns and marinate in turmeric and salt for 3 to 5 mins. Add oil or ghee to a pan and fry onions till golden brown. Add marinated prawns and green peas and cover and cook for 10 mins. Add the rice and fry for a few mins. Add coconutmilk, ground coconut, salt to taste and 2 cups water. Cover and cook for 10 to 15 minutes till rice is done. you said add the and fry for few minutes.I donot get that how to do that.do i add boiled rice or un ripe rice? What is ground powder over here? Its not indicated in the ingredient list.